I have never done a live migration, SHOCK HORROR! I have always taken the easier road (some would argue) of doing a clean install, and rejoining the client machines afterwards. It was a conversation with Jeff Middleton of SBSMigration.com that really got me thinking of migration as a viable option for installing a new server into a network. Let me just clarify that for a moment, of course migration has always been viable, but for me, on the small(ish) networks i have supported, a migration always posed far more headaches than a clean install did. At least, that is my point of view. So, step one, my current server, SBS 2003 Standard R2, Single NIC configuration, nothing special about it, and more or less out of the box install – so ill need to bring it up to current patch levels and make any configuration changes recommended from the 7/8 years SBS 2003 has been around (is it really that long?) experience tells us are wise! So i am downloading the SBS BPA from here choosing the 2003 version of course. You may need to adjust your IE security settings, or better yet download to a client PC and copy across. So, go ahead and install this, then load it up. I always attempt to download any updates available, as new rules are released and quite often can pick up something previously missed. Once this has completed, click on Select options for a new scan, a bit of a left over i think from other BPA’s as there is only one option, which is the name of the report. I am calling mine, SBS Essentials Migration Scan. You should now sit back for a few minutes whilst your server is scanned, and you see your report. 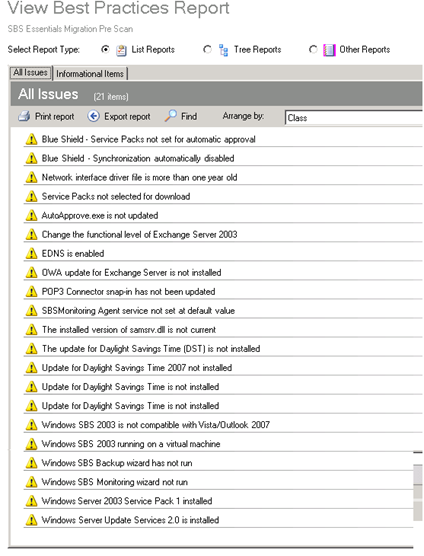 So as you can see on my report i have 21 items that are recommended (warnings) to be resolved, and luckily no critical ones. I am going to go through each one in turn and it’s resolution and then move onto the next stage of my migration. But for now it is late, and i seem to have been struck by the Flu that has taken out most of the HSBS MVP’s that made the trip to Summit last week, so i am off to bed.